A special place in paradise, Windemere is located on 200 FT of beach frontage. 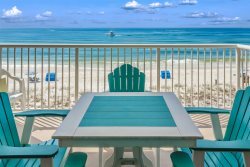 View the crystal blue Gulf from the large balcony, accessed from the Living Room and Master Bedroom. This condo has 1176 SF of living area with Ceramic tile in Foyer, Living Room, Dining Room, Kitchen and Baths and carpeted Bedrooms. Electronics include 40" TV, DVD, VCR in Living Room TV, 40" TV/DVD in Master and 32" TV/DVD Guest Bedroom. Valerie was great very friendly and easy to work with . Loved the unit and complex!! Michelle was good to work with. She accommodated our needs well. The property was as advertised. We would stay there again. Enjoyed our stay - We really like Windemere 906! The unit had a great Decor, bright and cheery. Loved the deck furniture. We would recommend this unit to everyone. We would rent this unit again.